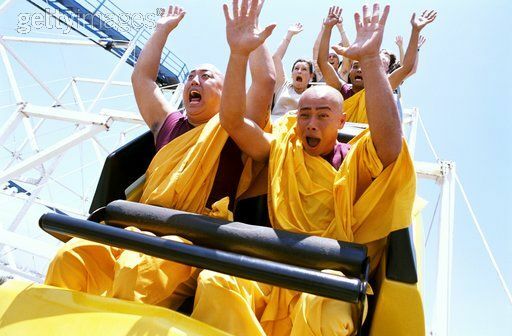 Another week gone and I’m still on the roller coaster. At times I’ve wanted to cry and at times I’ve felt free enough to laugh. Oh the twists and turns of this inner turmoil, this ride that I know is needed but not enjoyed. Waiting for any doctor isn’t pleasant but waiting for one who cuts away lips for a living isn’t a great experience. In this man’s head and hands lies my future – at least that’s what my frantic ego is telling me. Deeper down I suggest to myself that I’m a bit of an illusion, a Cosmic kid conjured up by Divine Love. I didn’t ask to be born, at least as far as I know; my life seems to be the Divine Will, an actor on a stage and all that. So ultimately, it’s the scalpel of Spirit Breath that will have its way – a way of healing for it can do no other. I’ve been topping up my trust by reading a wee book by Brandon Bays, a spiritual teacher who zapped her own tumour in six weeks by emotional healing and cell reprogramming. It’s been doing the trick when ego packs up and goes to bed for a rest. It all makes sense to me, the wounds of past traumas affecting the DNA output of our cells etc. According to Brandon journeying through our inner layers of trapped emotions takes us into the Void, a dark place that terrifies us. Yet, once we jump in, or are Divinely pushed, we find a wondrous joy on the other side, a place where all sorts of miracles take place. Finding Source and the powerful Self within, restores our immune system to do its thing. I’ve no doubts about the theory, yet facing up to our hidden, repressed emotions isn’t as easy as it sounds. Ego has defended us from pain for decades and isn’t willing to hand over its realm of expertise to a therapeutic new kid on the block. Anyway, I dipped my toe in the waters of Self exploration a few days ago. Asking my body what it was trying to tell me, a number of images and accompanying tears began to flow through my conscious mind. I saw a nine-year old me standing in front of a 30-year-old Cub master, with a stunned look on my face. We’d been making models for our handcrafts badge and I’d put in plenty of hours to rustle up a wee cardboard aeroplane for inspection. Unfortunately, my Scouting inspector wasn’t that impressed. ‘Go away and make another one Dylan!’ was all he could muster as his words pierced my tender heart. A failure at nine, as pronounced by a pseudo-father figure. Tears gently rolled down my face. Next, I was taken to a scene that took place the following year. I’d previously entered our local cycling proficiency test and won a monetary price. I’d been invited to the local Town Hall for the presentation of prizes and felt like a million dollars. However, second time around, after weaving in and out of a row of suitably placed obstacles, I’d been quickly failed by a male judge with a clipboard. This time around no certificate and no price. Again a male quasi-father figure had clinically rejected me. Off I cycled, in the direction of home where waves of failure swept over me as I lay on my bed in an embryonic position. The revealings kept coming. I saw myself, as a 10-year-old lad, standing in a row of boys at the front of our Year 5 classroom. We’d been playing with a football during lunchtime in the inner sanctum of our beloved teacher Mr Barrett. He’d been a soldier and was a real man’s man with his cigarette and role of school soccer coach. He lived quite close to me and I enjoyed the father-like concern he showed me regarding my academic progress. Anyway he we were, lined up like ten-pins about to face our just desserts for accidentally knocking over his favourite pot plant. After a loud telling off the dreaded double rulers were produced and brought down with a stinging whack on our outstretched hands. My we head reeled with emotions – shame, rejection, betrayal, the lot. Again, I’d blown it in the eyes of a substitute father figure. A warm, salty tear trickled down my 58-year-old cheek. So, are these emotions something to do with my present lip-cell DNA? Is something within, trying to tell me something about my past, present and future? Why my lips, the physical expression of my prophetic voice? Clearly, father-like rejections are bubbling up to the surface. Time to get real and let it all hang out in the Light. Brandon says my job is only to co-operate and forgive, both myself and others. I do that gladly as I head further in to what lies buried in the shadows of my psyche.. Thank you for all your messages of support and prayers. Do feel free to send me any insights you may have; I’ll appreciate them all. Meanwhile I’ll sit still and let this ride take me where it wills, knowing that it is just that, a ride. I’ll write again next week, prior to my appointment with my surgeon. Wouldn’t it be wonderful if he were a man of Spirit! Though maybe better if he were as good as my doctor claims. Prayers for complete healing Dylan. Self-discovery and subsequent healing lightens our load for sure. Health to you my friend. Thank you Elaine.Your prayers and encouragement are much appreciated by this wee Irishman! Best wishes Dylan. Two years ago I had to look inward to find the root of a cancerous breast tumor. Self worth was at the dark core. I do believe that the work I did before the surgery to remove the tumor cleared more than my spirit. Even though I believed I may have healed myself there was enough self doubt I did have the surgery. My confidence was much stronger with treating my whole self since the lumpectomy. I didn’t use conventional medical followup. Nature,love, God, and I have been keeping me well. And feeling my self worth… (I am a gift to this world) has changed everything. Love to you on this new challenge and prayers for healing. May you soon obtain the full measure of your creation. Hi Cecelia. Thank you for sharing your own wee experience of inner healing and physical surgery. We are such complex creatures and yet in other ways so simple. We thrive on love and are wounded by hate. Like you I am looking within but also listening to the conventional wisdom of the medical profession. Yet above both I look to Source from which I have come. Your love and prayers are deeply appreciated and as you say may I enter into the fullness of who I really am through this wee experience. This is not just any film; it’s a powerful message about paying attention to what life has to teach us, mostly from our pain and suffering. I hope that if you haven’t seen the film yet, you will. See if it speaks to you, as it did to me. The Chinese healer gave him the assignment to go back into his boyhood and discover the root causes of his illness. And so he did. Powerful stuff. Several years ago I lost my voice, not long after my mother died. I found it ironic, as did others, that I used my voice to “glorify the Lord” in leading worship. For over a year I couldn’t speak a word, and so I taught my daughter sign language so she could communicate with me. All the while, I looked deep within to try and discover the root cause for this sudden affliction, which seemed to have happened overnight. In my search I had flashbacks, returning to first grade when I won a talent show, to all the rejections following. These rejections coming from those closest to my heart, those I loved most, those who didn’t want me to be a part of their world. Finally I went to a healing hands lady and the floodgates opened and I cried a bucket, although I didn’t understand what was happening at that moment. All I knew is that I was broken and needed mending. At some point I learned that it’s in my brokenness that I see Him clearest. It’s in my darkest hours that I look deeper. Suffering is a gift, plain and simple. It causes us to go within and hunt for the hidden treasure in these earthen vessels. Sending bluebirds and healing hope. I can identify a lot with your own experiences. I lost my voice as well for a while, with it only returning once I responded to the Divine nudge to start blogging and write my first book. Like little kids we often shut up shop when rejected by significant others and block our own being and creative flow. Thanks for the tip regarding the movie. I’ll definitely watch it.Our psyche-souls must be like a chimney with a big bird’s nest stuck up it! Smoke everywhere – everywhere except where it should be that is! You are right , our suffering is an authentic means of learning who we really are. Thankfully when we finally get the message it can return from whence it came. Thank you for the bluebirds and healing hope. Both are much appreciated! Thanks Arthur. The thoughts of an Ulsterman have great power in the psycho-spiritual realm. They are deeply appreciated my friend. Your voice will not be silent – and your words will not return empty! Thank you Marianne. I needed to hear that. I intend to write as long as I draw breath. You definitely have a prophetic streak in you – I can feel it from here!